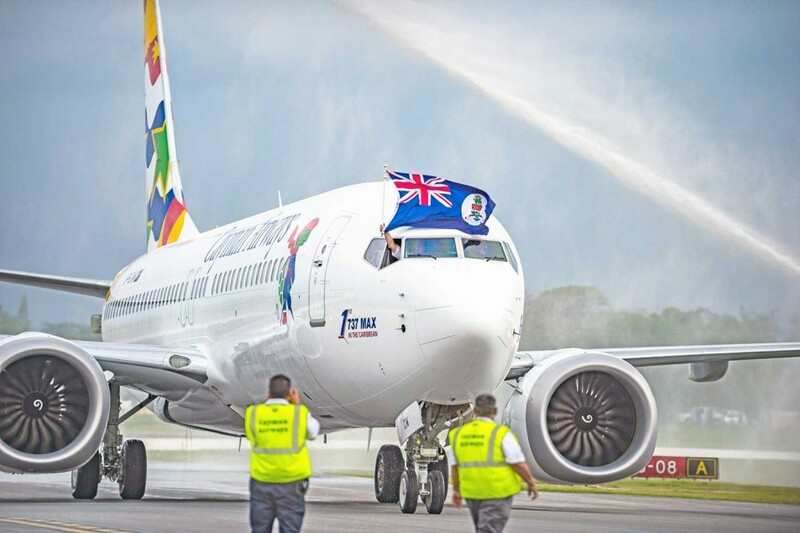 Pirates, politicians and hundreds of onlookers waited anxiously Friday afternoon for the arrival of Cayman Airways’ newest jet, the Boeing 737 Max 8 – the first of its kind in the Caribbean. Around 5 p.m., the state-of-the-art aircraft flew over the Owen Roberts International Airport runway, dipping its wing to the left in a salute to the crowd. After taking another pass around the island, the plane landed about seven minutes later, offloading Cayman Airways staff, government officials, and executives from Boeing and the leasing company Air Lease Corporation. Inside the plane, blue mood-lights cast a soft glow over the 29 rows of slick, leather seats, as flight crew smiled in greeting to the people walking through there. With Cayman Airways recently celebrating its 50th anniversary, the company’s CEO Fabian Whorms said the 737 Max 8 is the perfect aircraft to take the airline into the future. He said the new plane has 40 more seats than the 737-300 that it’s replacing, burns about 20 percent less fuel, and is more affordable than any other potential replacement. Tourism Minister Moses Kirkconnell said that it is crucial to maintain the government-subsidized airline’s fleet, given that the company accounts for about 34 percent of the territory’s arrivals. “So, do not even think about how we can go forward and build our tourism industry and our country without Cayman Airways,” he said. Cayman is the first place in the Caribbean to have the new 737 Max 8, and one of the first in the world. Kishore Korde, executive vice president of Air Lease Corporation, said Boeing has received orders for 5,000 of the Max 8s, but that only 215 have been delivered so far. One of the other planes in the first batch of Max 8s, operated by Lion Air, had a fatal crash in the Java Sea on Oct. 29. The plane crashed shortly after take-off and an investigation has been raised into how well it functioned, the maintenance work performed on the aircraft, and the actions taken in the flight deck during flight. Last month, Cayman Airways stated that it is nevertheless confident in the new model’s safety. The Cayman Airline Pilots Association also issued a statement on the issue on Sunday, saying that it, too, has confidence in the Max 8. The association said it believes that human error likely contributed to the Indonesian crash, according to the statement, signed by captains Gary Hydes and Adrian Miller. Three other Max 8s are being leased by Cayman Airways, and are scheduled to arrive in March and September next year and in September 2020. Uses for the planes include servicing the new route to Denver, which is scheduled to begin next year. Government and airline chiefs have declined to reveal the exact cost of the new leases, but it was estimated last month in the Legislative Assembly’s Finance Committee that they may lead to $10 million more in annual costs for Cayman Airways. At Friday’s ceremony, Mr. Whorms said he would not answer questions about that or other “political” issues. “Today’s not for that, today’s not for that,” he said. “We’re not going to get into any of the politics or any of those issues.